1) Consult your veterinarian and inquire about laboratory tests such as a blood and urine test for your pet. All senior cats especially should have a routine blood and urine test to avoid your cat having end-stage renal failure. Laboratory testing and a veterinary exam are an important first-step. Keep a copy of your pet’s laboratory results so that you can work with your veterinarian to monitor your pet’s progress and start feline or canine kidney disease treatment. Depending upon your pet’s laboratory values, discuss administering subcutaneous fluid therapy, phosphorous binders and any other recommended treatments. Conventional veterinary care treatment options are limited. Using a combination of conventional and holistic veterinary care will give your pet the best results. 2) Changing your pet’s diet is an essential step of feline and canine kidney disease treatment. Change your pet’s diet immediately to a kidney-friendly, reduced-phosphorous diet rich in Omega 3 fatty acids. Some pets may have health conditions such as anemia, food allergies and pancreatitis which will require adjustments to a typical kidney diet. Prescription kidney diets often contain byproducts, grains and synthetic ingredients so a natural plan combining premium commercial foods mixed with homemade is recommended. While there isn’t a ready-made commercial diet for kidney disease, Ask Ariel will be happy to include some free diet tips on your packing slip. We have extensive experience treating dogs and cats with kidney disease so please be sure to include what you are feeding in the box on the checkout form when you place your order. 3) Natural, veterinary-approved supplements can help control the progression of your pet’s kidney disease. Using a variety of different supplements will support your pet in multiple ways. For example, some vitamins strengthen the remaining nephrons while others aid in detoxification and still others help with the breakdown and digestion of protein. It is quite common for pets to lose some kidney function with age. Renal insufficiency is especially common in senior cats. The kidneys are bean-shaped organs that operate as filtering mechanisms in the body. The kidneys filter out toxins in the blood such as metabolic wastes, drugs and excess mineral salts as well as regulate the acidity of the blood. The kidneys also help regulate blood pressure, the production of calcium and phosphorus metabolism, and produce a hormone that stimulates red-blood-cell production called erythropoetin. Since the kidneys perform so many important functions, it is easy to see why kidney malfunction would greatly impact the way your pet feels and behaves. Once the kidney function starts to weaken, pets may develop a variety of additional health issues such as acid stomach, anemia, high blood pressure and pancreatitis. In the blood, three levels are especially important to test for kidney disease. These are creatinine, BUN (blood urea nitrogen) and phosphorous. BUN measures the amount of urea nitrogen, a waste product of protein metabolism in the blood. Urea is formed by the liver and then taken by the blood to the kidneys for excretion. Because urea is cleared from the bloodstream by the kidneys, a buildup in the blood is an indicator that the kidneys are not functioning properly. Creatinine and phosphorous are important markers for kidney disease as well, as they are also excreted by the kidneys. The difficulty in canine kidney disease treatment or feline kidney disease treatment is that the ability to remove metabolic waste products is often outweighed by the buildup of those toxins. The pet is not able to keep up with the regular detoxification required because the kidneys are impaired. Thus, the pet gradually becomes more toxic and the body chemistry becomes more acidic. Unlike liver disease where the body can build and repair new liver tissue, the nephrons (functional units of the kidney) are damaged forever and cannot be replaced. 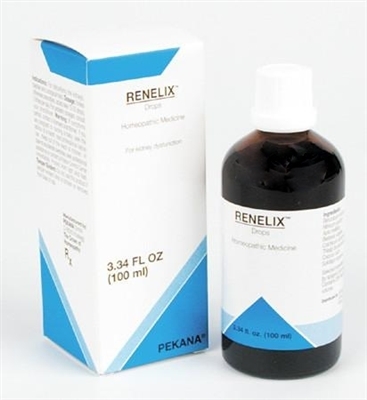 What is important is to help the functioning nephrons perform at an optimal level. Conventional treatment for kidney disease in pets includes a reduced protein and reduced phosphorous diet, subcutaneous fluids, use of phosphorous binders and medications for blood pressure regulation, if needed. Holistic care in combination with conventional treatments is essential. Pets can eat a natural, kidney-friendly diet in place of commercially prepared prescription diets that many pets might not eat and can contain chemicals and synthetic ingredients. Supplements can help the kidneys to break down protein, excrete toxins and perform at a significantly improved level. 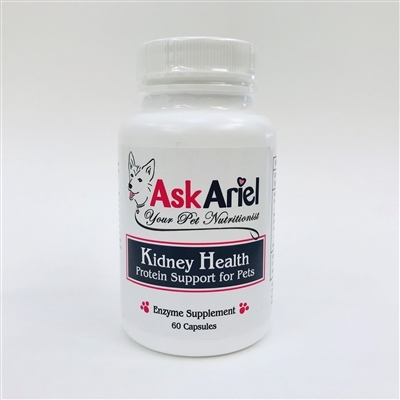 Many cats and dogs that use the Ask Ariel kidney diet and supplements live a higher quality and longer life than was given in their initial prognosis.